Intercession (Shafa’ah) in Islam takes many forms. But unfortunately, some people have wrongly interpreted the verses of the Holy Quran to mean that dead saints or prophets can intercede for human beings while they are still alive on earth. And that is why they go forward for saint-worship, by setting up Dargas (mausoleums) of saints everywhere. It is very important to understand that Allah is the Best Interceder/ Intercessor for His servant. He is the Best Being who can waive away all the sins or faults of someone, forgive him and make him taste His pleasure and paradise. Allah says in the Holy Quran: “Say: ‘To Allah belongs all intercession’.” (Az-Zumar, 39: 45). Moreover, Allah shall allow some of His special servants on the Day of Judgement to intercede in the favour of His other servants. The Holy Quran calls our attention to it in the following verse: “And they say, ‘The Most Merciful has taken a son.’ Exalted is He! Rather, they are [but] honoured servants. They cannot precede Him in word, and they act by His command. He knows what is before them and what will be after them, and they cannot intercede except on behalf of one whom He approves. And they, for fear of Him, are apprehensive.” (Al-Anbiya 21: 27-29). [Huzur (atba) related also about the great feeling he had this morning after reading his portion of the Holy Quran, to read also the Surah Al-Anbiya which deals with the lives of the prophets of Allah]. Like we know, the peoples of the past had taken some of their prophets or messengers as ‘sons of God’ and thus this verse comes as an eye-opener for all mankind to beware of falling into this devilish trap of associating a son or anyone else in the worship of Allah or that Allah has - God Forbid - begotten someone, like a human being! Moreover, Allah says that all human beings, including His prophets are but human beings and they cannot do anything without the approval or permission of Allah. They are themselves fearful of Allah and cannot proceed for any work without first receiving express permission for the same. Thus, no human being can intercede for another person without the prior permission of Allah, and the same goes for our spiritual bodies after death. The spirit of a prophet or even an angel cannot come to the rescue of someone else without the permission of Allah in the realm of the after world. It must be borne in mind that whether a prophet of Allah intercedes for another person, whether during his lifetime, during a Divine Manifestation or even after death, when someone’s soul is in some sort of trouble in respect to his judgement before Allah, even then, the mercy of Allah is demonstrated in the fact that by giving permission to His special man, the prophet of Allah, He (Allah) is Himself taking the initiative to forgive that particular person. By giving the permission to His prophet or Caliph (i.e. the Khalifatullah) to intercede on behalf of someone, this in fact means that He (Allah) has already decided to forgive such person, but He chooses to give this blessing of intercession to His prophets to show how much love He has for them and how great status they have in the sight of Allah because of their devotion and obedience to Him, as His special envoys on earth. During the life of a prophet or Khalifatullah, this special permission for intercession acts as a sign of His truthfulness, a sign which Allah uses to make the people aware of His presence and support in favour of His Envoy. All prophets and revivers of faith receive this blessing during their lifetime, and after death also they shall be granted that blessing as and when Allah requires them to. For example, the Holy Prophet Muhammad (pbuh) is recorded to have said: “Allah gave me the option of choosing between the power of intercession or having half of my Ummah admitted to Paradise without any reckoning. I chose the power of intercession because that is more important and will be more useful. Do you think that my intercession is for the pious Muslims? No, on the contrary, it is for those sinners who are steeped in sins and have committed grave crimes.” (Ibn Majah, Ahmad). But there are also instances when Allah does not give any permission, yet through the mercy which is found in man, and in the Man of God in particular, the latter seeks the forgiveness of Allah for some people who may be near to him, i.e. his blood ties or other people. This is clear in the example of Hazrat Ibrahim (as) who sought the forgiveness of Allah for his guardian (i.e. his father) who was an idol-carver and idol-worshipper because he promised the latter that he shall pray for him. Though he knew in his inner heart that Allah hates “Shirk” (association of partners in the worship of Allah), yet he ventured to seek Allah’s forgiveness for his father, and though Allah did not grant him his request of prayer, but He was immensely pleased with the purity and tenderness of heart which Hazrat Ibrahim (as) displayed. Allah says: “Ibrahim asked forgiveness for his father because he had made a promise to him, but once he realized that his father was an enemy of God, he washed his hands of him [i.e. He abandoned him]. Ibrahim was tender-hearted and forbearing.” (At-Tauba 9: 114). [Huzur (atba) also gave the example of Prophet Nuh (as) who interceded/ prayed for his disbelieving son, but Allah reprimanded him for, for in the sight of Allah it was an inappropriate request as Allah knows and man, even a prophet does not know. Allah told Hazrat Nuh (as) that this was not his son, but it was the people in his arch (arch of Noah) who were his real family. In another place of the Holy Quran, Allah says: “And how many an angel is there in the heavens whose intercession does not avail at all except after Allah has given permission to whom He pleases and chooses.” (An-Najm 53: 27). [Huzur (atba) explains that this verse and its explanation is an answer to a question which has been put before him, and which he chose to address in this sermon for the attention of one and all, to benefit all people]. “Indeed, those who do not believe in the Hereafter name the angels female names, and they have thereof no knowledge. They follow not except assumption, and indeed, assumption avails not against the truth at all.” (An-Najm, 53: 28-29). It is a truth that cannot be denied that in this temporal life, women cannot be appointed as “prophets” of Allah, however pious they are. This is a special status granted to special men whenever Allah chooses to send someone from Him for the reform of a nation and mankind, especially with the advent of the universal prophet Hazrat Muhammad (pbuh) and his special deputies (the non-law-bearing prophets and reformers) after him. In the verse 27 of Surah An-Najm, Allah calls our attention to the fact that the Angels also can intercede in favour of men. Wherever there are pious men, women and children, angels are all around, like a fortified congregation to pray for them, for their material as well as spiritual success. But even for the angels, like men on earth, some of them have higher degrees than their comrades. For example, like the archangels Jibra’eel, Mika’eel and Israfeel (as). Hazrat Muhammad (pbuh) is known to pray Allah in the following words: “O God, Lord of Jibreel, Mikaeel and Israfeel, Creator of heaven and earth, Knower of the unseen and the seen. You are the Judge of the matters in which Your slaves differ. Guide me with regard to disputed matters of Truth by Your permission, for You guide whomever You will to the Straight Path.” (Muslim). Thus, what we learn from the teachings of Islam is that the permission for Shafa’ah (intercession) can be given to the chosen servants of Allah, be them the prophets and angels, and both species are guided by Allah to accept those rights of intercessions and pray for the other servants of Allah, especially for those who are in serious danger of falling into hell and receiving a grievous punishment. This intercession can be granted on earth itself, especially during the lifetime of a prophet of Allah or Khalifatullah or Reformer of Islam, but mostly so in the hereafter. And it should be borne in mind that Allah is All-Forgiving, and He forgives whomsoever He likes. He can forgive any major or minor sins but He shall not forgive “Shirk” unless there is repentance and a genuine change in the person before his earthly death. If not, He would have forgiven the father of Hazrat Ibrahim (as), the Pharaoh in the times of Hazrat Musa (as) or even the paternal uncle of Hazrat Muhammad (pbuh) – Abu Talib – who loved him as his son, and protected him from all harms, yet feared the people and did not believe in the Oneness of Allah and the mission of His own nephew as prophet of Allah. 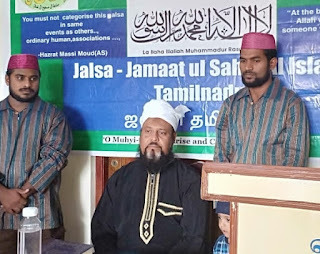 It is not a sin to affirm that even after the advent of Hazrat Muhammad (pbuh), the blessed deputies of his Ummah, the chosen reformers of Islam, shall also receive the boon of intercession in the hereafter also for the people of their epochs, because of their attachment to the Holy Prophet Muhammad (pbuh). The latter is narrated to have stated: “More people than the collective tribes of Banu Tamim shall enter Paradise due to the intercession of one man from my Community.” It was said: “O Messenger of Allah, is it other than you?” He said: “Other than me.” (Ibn Majah, Ahmad). And in the Holy Quran Allah says: “On that day no intercession shall avail except of him whom the Beneficent God allows and whose word He is pleased with.” (Ta Ha 20: 110). The granting of permission by Allah to intercede in favour of someone, is especially for those sinners whom Allah has in mind to forgive and by granting the permission to His prophets to intercede, it is a display of His affection for them vis-à-vis the others. May Allah help the Ummah of Hazrat Muhammad (pbuh) to understand this important subject, and not to confuse it with an unlimited permission granted to Hazrat Muhammad (pbuh) or any other of His deputies (the Khulafatullah, followers of the Holy Prophet Muhammad (pbuh)) for anyone. Allah knows best the hearts of His servants, and He alone knows who deserves to be forgiven or not, and whose hearts are repentant or not. All in all, everything rest in the Hands of Allah. His decision alone rules this world and the afterlife, and His every creation. Indeed, the true guidance, is the guidance of Allah. Ameen, Summa Ameen. 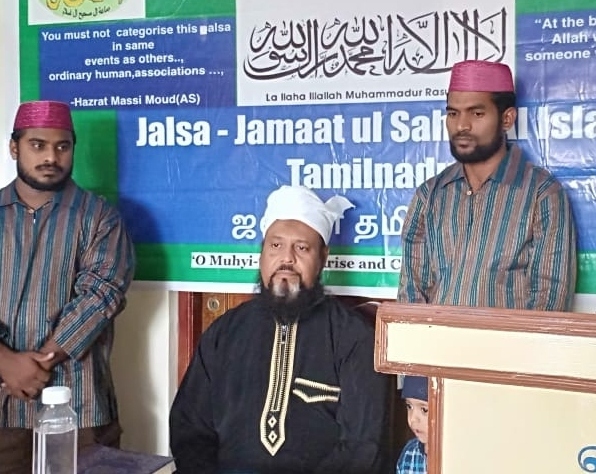 ---Friday Sermon of 25 January 2019~18 Jamadi’ul Awwal 1440 AH delivered by Hadhrat Muhyi-ud-Din Al Khalifatullah Munir Ahmad Azim Saheb (atba) of Mauritius.